FreedomNow.org is a non-profit venture started by Ethics 360, a group of companies providing services related to anti-bribery education, training and publishing for multi-nationals and their third party intermediaries. The principal goal of this project is to collect detailed information on known traffickers and make this available to governments, banks, anti-money laundering (AML) data providers as well as general audiences around the world. 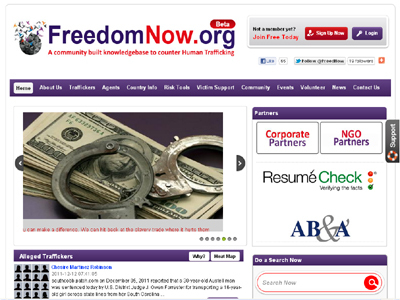 In addition, FreedomNow.org features a host of resources for trafficking victims and their advocates, including NGO directories categorized by country and a job board where NGOs can advertise vacant positions. FreedomNow.org is non-profit profit venture based on “Wiki” technology, which gives power to any individual who has relevant information regarding human trafficking to contribute for the sake of humanity. Therefore, it has no competition, this project is a social cause.